My name is Dilmaya Tamang. I am from Kathmandu. I was born in 2059/02/06. My father name is Lal Bdr. Tamang and Mother name is Jiri Maya Tamang. There are 5 members in my family. When I was in village, I used to read in government school in class 3. I was nine years old when I was in class Three. I always used to go in school. My family member is very poor family. My Father used to work hard for our study and for our survival of our family members. One day my elder sister get the chance to schoolarship up to class 12. Now she has passed S.L.C and waiting for the S.L.C. result. She has the great chance to study up to 12 class by schoolarship. And I got the chance to get help from EcoHimal organization for giving a good education by bringing in boarding school. 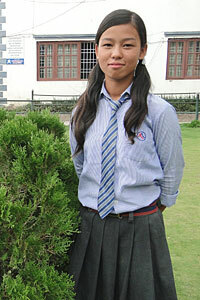 When I reach the school in Kathmandu I was unknown from everyone and I became to much scared. At that time I don't know how to talk English. I was unknown from friends too but one day on the new year of 2089/01/01 they all are coming to talk with me and dance but I was so scared. I did not did anything. After days pass I became friendly with all teachers and friends too. Then after I came from village I again study in grade III. At first I don't know how to talk english so that at first term of grade III I became fail in exam and all the days pass by beeing 10th in mid term. 15th in second term also again 15th in final term too. Then I become close with all friends and teachers too also I can speak english too. Then again I study in grade IV. On the february I was suffering from Chicken pox and I did not go to school up to two weeks. From that day I became too weakness. I have not gone to school up to two weeks also in first term exam of grade IV. I become second position. I was very happy to hear also my class teacher Pashupati Mom also became very Very much happy. After that I focus only in my study. I have got lots of knowledge in school from teachers side. In school there is one small garden and one ground where we can play basketball, football etc. First of all I will like to say, Thank you to Eco-Himal sir for giving me this golden oppurtuniy to study. When I was in village I was not getting good education but now I have got lots of education to make my brighter future.